The strings are picked up by small cylinder shaped piezo elements with the size of 5 x 15 mm installed directly underneath the strings in holes drilled into the bridge. 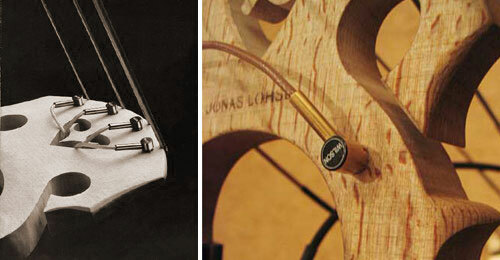 The volume and sound of each string can be regulated individually by turning the elements. The Wilson PU is also available as single element PU, which can be installed into the bridge’s leg. Depending on its position, the element capture more of the strings’ or the body’s vibrations. I’m pretty sure this i s the best pick-up in the world. A nice full and warm tone, even without using a preamp. And though there has to be drilled four holes in your bridge, it’s pretty easy to install. The drill comes with the pickup. Dansih bassplayer, Niels-Henning Ørsted Pedersen (NHØP) never used another pickup, once he heard the wonderful Wilson-sound. As far as I know, NHØP has always used a magnetic pickup (built into to the fingerboad) besides the Wilson, and blended both signals.